Comber LK 64 is a old model and runs at max. 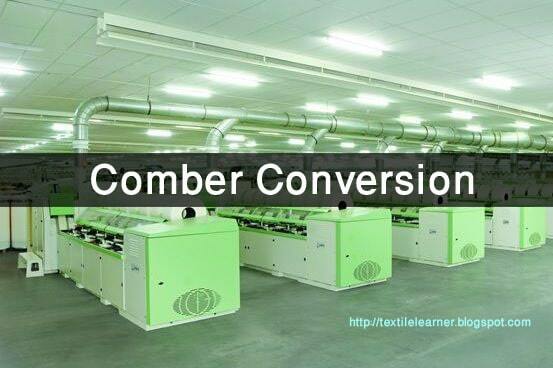 400 nips per minute and by upgrading it to the 64Z it will enhance the speed of the comber up to 500 nips per min and also gives the effective combing process. In this article, I will explain how to do comber LK64 to LK64 Z conversion. Fix the needle bearing HK6020 to the both the larger hole keeping flat surface on which the bearing name is written inside and curved surface on out side . Fix the J32 Internal circlip and then needle bearing HK25200 to the both the smaller hall. Fix the control disc on the 143T gear using 3 k12×45 boltsand spring washer M12. Fix the cam on the control disc by 3 , K12× 40 bolts and M12 washes. Here the size of the bolts should be of optimism length if it is longer it may touch to the control disc and damaged it. Here top nipper actuating shaft is rotating by Means of the gear combination. In comber LK 64Z top nipper actuating shaft is rotating by Means of the crank and Latch. Fix the pawl sheet on outer side of the guide cylinder and put M4 washer then tighten the S22 bolt with hex nut. 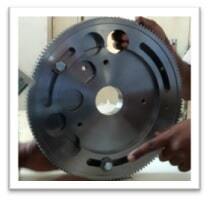 => It is driven by Means of Huge Swivelling plate and differential gear mechanism as shown as below. 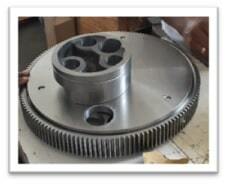 => It is driven by small swivelling plate and differential gear as shown as below. First of all remove the belt from main motor. 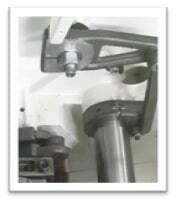 Disengage the main bearing housing from the head stock. Disengage the cross head and swivelling crank arm assembly. Remove the pin from H bracket and disengage the swivelling plate and cam. Remove the swivelling plate along with the cam fitted on it and Latch and full bracket assembly. Remove the copper bearing stud . Loose all the bolts of bottom nipper crank and make it loose on bottom nipper shaft. Disengage the coupling of bottom nipper shaft. Dismantle the waste index complete and top nipper actuating gears and sockets . Pull the bottom nipper shaft from the rear side of head stock until the H Bracket comes out of it. Disengage the 56T gear and the . Remove the differential end bush and dismantle the differential gear assembly. 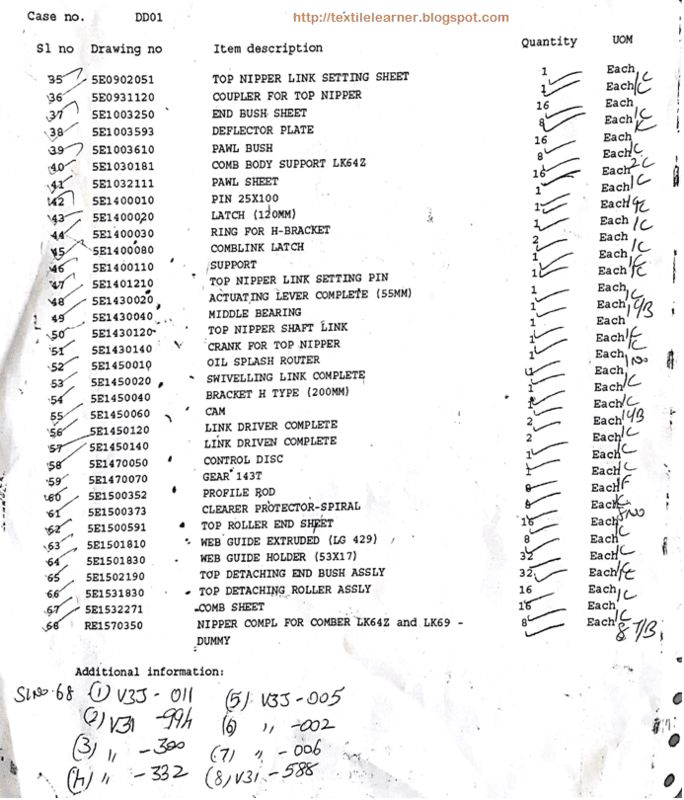 Dismantle the unicomb link assembly. Then in Longitudinal unit, dismantle the top detaching roller loading complete (i.e. 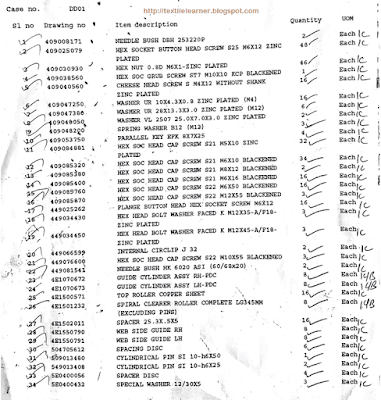 Guide cylinders both LHS and RHS) and Nipper assembly according to standard procedure. 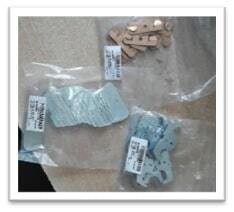 Dismantle the unicomb sheet and unicomb body support as well as web extruder and web guide holder. Clean the all the spares and machine using patrol . Load the H Bracket, H bracket bush to hold bracket on shaft at fixed position and noil index bush on bottom nipper shaft in correct position and load the bottom nipper shaft . Fix the copper differential bearing stud to the middle frame of head stock. Fix the swivelling plate on the cam which is fixed on the control disc. Load the 143T gear along with control disc, cam and swivelling plate. Fix the control shaft . Fix the unicomb link assembly and apply standard torque. Fix the main bearing assembly and cross head. Enter the pin into the H Bracket keeping hylum washer, latch, hylum washer, swivelling plate and hylum washer inside respectively. Fix the waste index complete at 24 combing index. And applies torque of 120 N.m to bolts of the Complete. Fix the differential gear and half bracket and apply 120 N.m torque to the bolts of half bracket. Fix the differential gear end bush and set the axial play 0.2 mm in differential gear box. 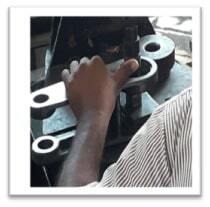 Fix the full bracket (swing lever plate) and apply 200 N.m torque to the bolts of full bracket. 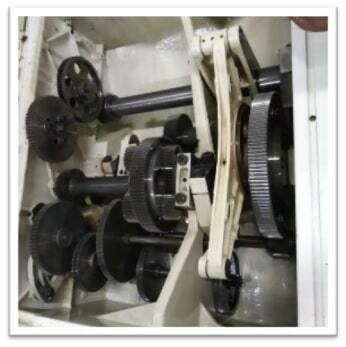 Fix the 56 T gear and apply torque of 200 N.m to the bolts of that gear. 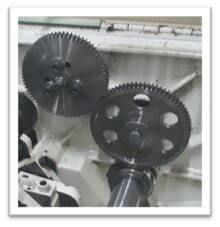 Check the axial and radial play of the differential gear. It should be 0.2 mm and zero mm respectively. Fix the top nipper crank at the 24 combing index. Check the torque of all the bolts in Head stock. Then In longitudinal fix the top Detaching roller loading ( guide cylinders) and profile rods. Fix the Nipper assembly as per the standard procedure. Fix the Nipper crank arm on the bottom nipper shaft and applied torque as per the stand. Fix the unicomb body support and unicomb sheet. Do the all the settings of longitudinal .I.e bottom nipper to detaching roller setting , setting between top and bottom nipper, unicomb to top nipper setting, fleece guide setting, brush roller and air shield setting, brush duct setting, top comb setting . Add the 7 lire standard oil (.i.e. kluber or Berusynthgp 150, etc.) to the Gear box. Lubricate the required parts in the longitudinal. Fix the top detaching calendar roller and clearer roller . Check the pneumatic pressure . 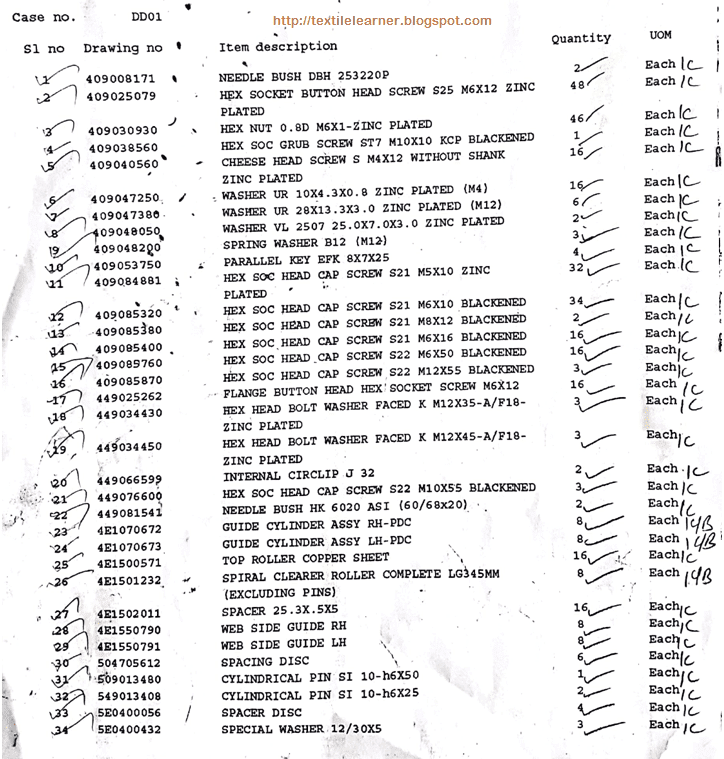 Set the Required waste index According to noil% to be extracted . Load the lap and inch the machine.